There is a new coupon available for Sunlight and Snuggle products! 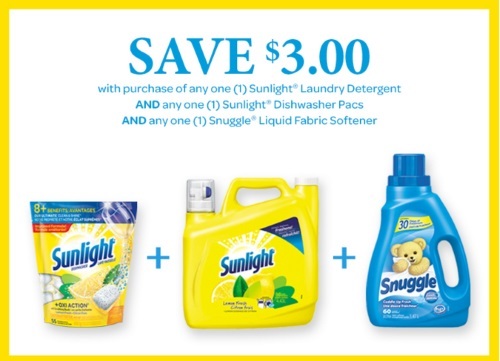 Save $3 off when you purchase Sunlight Laundry detergent and Sunlight Dishwasher Pacs and Snuggle Liquid Fabric Softener. Please note you need to purchase all 3 products together to use the coupon. This coupon is available via mail and print on the Walmart Save.ca coupon portal while quantities last.